The 4.5 and 5.5 duraDOT drumhead tone modifiers are made to help shape snare and tom head frequencies with an added focused stick attack. The 4.5 and 5.5 duraDOT drumhead tone modifiers are made to help shape snare and tom head frequencies with an added focused stick attack. 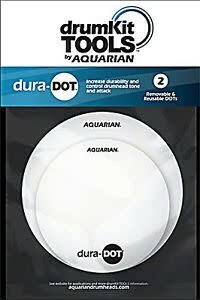 The duraDOT also adds durability and longevity to your drumhead. Like the t-TAB, the removable duraDOT can be played on, and placed anywhere on the drumhead for quick, real-time tone adjustments. But unlike the t-TAB's fine tuning effect, the duraDOT's changes are dramatic. Go from a wide open, high frequency snare drum ring, to a wet, flat and funky backbeat sound in the same song! The proprietary adhesive backing can be used over and over again. An included DOT STORAGE SHEET can be attached to the side of the drum to hold DOTs for quick and easy, real-time tone change. Two DOTs ( one 4" clear DOT and one 5.5" coated DOT) included in each package.